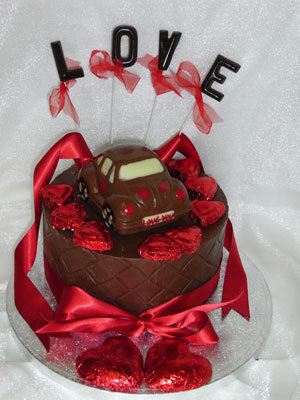 Hand-made milk chocolate Valentine beetle car, on a single milk chocolate tier. Decorated with foil wrapped milk chocolate hearts and ribbon. Chocolate letters (on display wire) reads 'Love'. Message on Beetle car number plate reads, 'Love You'.